ABC Greenlights LGBT History Miniseries "When We Rise". 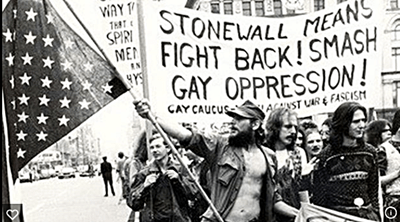 Home/Entertainment/ABC Greenlights LGBT History Miniseries “When We Rise”. ABC Greenlights LGBT History Miniseries “When We Rise”. Deadline reports that ABC has greenlit an upcoming miniseries about the history of the gay rights movement from its “turbulent infancy” to the present. ABC is reassembling the team of the 2008 movie Milk for another project about the gay rights movement, eight-hour miniseries When We Rise. Milk director Gus Van Sant has joined the mini, written/executive produced by Milk writer Dustin Lance Black and executive produced by the film’s producer Bruce Cohen. The project, which had been in development at ABC for more than two years, has now been officially greenlighted for production with Van Sant directing the first two-hour episode. He will executive produce the mini alongside Black, Cohen and Laurence Mark. So 46 years covered in 8 hours. Good luck. Lets hope that Dustin Lance Black actually does some research unlike that of Roland Emmerich. After all Black won’t have “The Life and Times of Harvey Milk” to adapt this time. And as we know from Emmerich’s “Stonewall” and the flap surrounding it that the events of that night have not been well documented and have been re-written many times.